FOLLOW THE LINK FOR THE CURRENT CLASS SCHEDULE! Our Youth program combines traditional martial arts training with high level character development and modern teaching methods. Not only do our students learn self-defense, they also develop very positive feelings about themselves and others. Children learn how to be respectful, focus and concentrate. They have fun while they workout and take pride in becoming more physically fit. OUR YOUTH PROGRAMS BUILD MENTAL CHARACTER, PHYSICAL STRENGTH AND THE APPRECIATION FOR THE VALUES OF DISCIPLINE, COURTESY AND RESPECT! There are many concerns with how our children are growing up in today's world. The pressures on our youth today are very different from previous generations. Children don't only have to worry about getting good grades and behaving, they have the constant battle of avoiding drugs, gangs, violence, bullying and peer pressure. and most importantly, RESPECT! The will learn to have respect for authority and for themselves! Safe kids make for happy parents. Kids tend to listen to people they like, trust and respect. Our highly trained teaching staff will share vital safety tips and teach your child practical self-defense. Most important is that your child understands some simple rules of safety. They will learn tips such as safety in numbers and learning to practice safe habits in their daily routine. Knowledge is power; we provide an explanation of common abduction lures and teach kids to be cautiously aware of their surroundings. No parent wants their child to live in fear, yet they want to know that their child is safe. We believe strongly in helping your child become confident and capable young adults who understand right from wrong and will know when to stand their ground and when to run-yell-tell. We also stress non-violent conflict resolution, how to avoid dangerous situations and practical techniques for getting away from a range of situations being cornered, being grabbed and being tackled to the ground. Our practical self-defense skills will empower your child and give the parent peace of mind knowing their child is safe at all times. 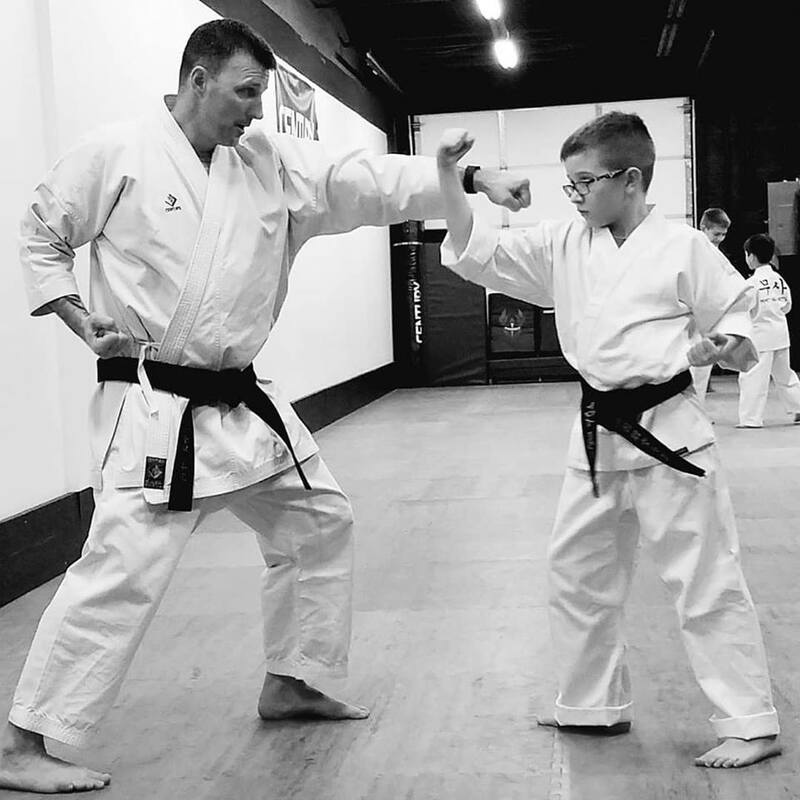 Your child will be trained when and when not to use their self defense skills and our students have a clear understanding of being responsible for their actions and attitudes. As part of our Black belt program, volunteering and giving back to the community is REQUIRED! The act of giving your precious time to those who need it is very rewarding. Our Warriors learn first hand what that feels like...AND THEY LOVE IT! Even our teenagers our more than happy to donate their time on the weekends!! WE ARE BUILDING FUTURE LEADERS! In 2017, we challenged our families with the "Muhammed Ali Challenge." This challenged individuals to volunteer at least 72 hours of their time to helping others. Our Warrior Martial Arts' students and families answered the challenge, and volunteered at the Siena Francis House for OVER 400 HOURS! We also collected almost 400lbs of food for the Food Bank and OVER 600 LBS of clothing and blankets for the Siena Francis house residents! 2018 WAS A GOOD YEAR FOR VOLUNTEERING! This year, we still primarily volunteered at the Siena Francis House. The cool thing about this year, was we were able to get the littlest Warriors involved as well! Our Warriors aged 3-12, were able to give back almost 100 hours to the Siena Francis House! They helped decorate the facility with festive artwork appropriate for every holiday! They packed candy bags for Valentine's day, made special cards for Moms, Dads, and Veterans, and even made ornaments for Christmas! Our older Warriors, teens/adults and their families, also volunteered! Our older group serves dinner at the shelter. We try to be there at least 2 weekends per month. Our Warriors have the most generous hearts and continue to give selflessly all year long.